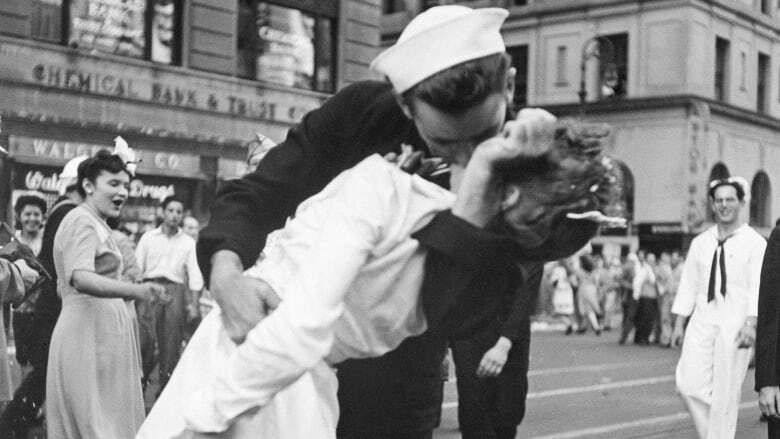 The ecstatic sailor shown kissing a woman in New York's Times Square celebrating the end of the Second World War died Sunday. George Mendonsa was 95. Mendonsa fell and had a seizure at the assisted living facility in Middletown, R.I., where he lived with his wife of 70 years, his daughter, Sharon Molleur, told The Providence Journal. I know some celebrate this guy for fighting in WWII but I strongly disliked him after reading how that picture came to be. That´s just not ok .
Why, how did it come to be? He grabbed random women and frenchkissed them. Call me oldfashioned or PC but I don´t find that acceptable. It´s sexual harrassment and the woman in the photo was not fond of it. I wouldn't advocate for people just doing that kind of thing out of the blue, but given the circumstances, I'd probably give him a pass. Oh, by the way, you're old fashioned and PC. KoolEaze said: Why, how did it come to be? That's sad news too. I thought it was so romantic, and perfect, right down to her legs. I thought that she was his girl. The woman in the photo did make numerous appearances with him on tv throughout the decades. I wonder what her attitude about it was all those years. I've always hated that guy since I first learned about it in History. I doubt she would have minded too much, considering she appeared on TV with him, as you said. Besides, people back then weren't the pussies they are today. As far as I know the one who appeared on TV with him was a different woman. The woman he kissed did not like what happened. I've seen them introduced as the man and woman in the photo by the hosts.